October 19, noon, Friends of Peacham Library –Friends plan great events in support of the library. October 20, 1:15 pm, Tuesday Theatre – Spencer Tracy, Sid Caesar, Milton Berle, Ethel Merman and four other all-star comedians star in this mad-cap, zany movie. It’s a crazy world, or maybe a Mad, Mad, Mad, Mad one, when eight vacation-bound travelers learn the location of a stolen treasure in a chance meeting with a stranger. Be ready for the laughs and a zany time. Rated G.
October 20, 7:00pm, Asperger’s Support Group – This is the first meeting of a new support group for parents and /or guardians of children, teens, or young adults with Asperger’s syndrome or high functioning autism. October 23, 10am-noon, Coffee Hour – join us for a cup of coffee or tea, a sweet or two and good conversation. Suitable for all ages! October 26, 6:30 pm, Peacham Knitters and Puzzlers— Bring your knitting or other handwork for an evening of creativity and chatting. Or work on the current jigsaw puzzle. October 30, 10am-noon, Coffee Hour – join us for a cup of coffee or tea, a sweet or two and good conversation. Suitable for all ages! October 31, 5:00pm – 7:00pm, Trick or Treat at the Library – Drop in for your treat. 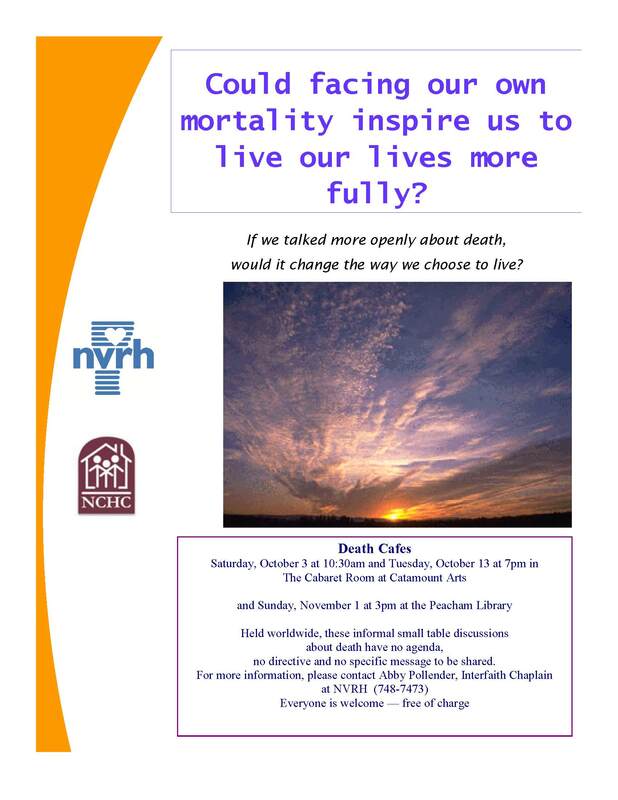 November 1, 3:00pm, Death Café – Drink tea, eat cake, and talk about death. There is no agenda, no advertising or conclusion, just the opportunity to talk about death.